On a plane in the late eighties I read an article about a glorious rustic hotel in an amazing setting, on a lake with mountain and valley views and a turn of the century golf course. Departing the plane, I neglected to take the magazine and promptly forgot the name, but the compelling image of the place was imprinted on my mind. Several years later, I acquired a copy of Harvey Kaiser’s “Great Camps of the Adirondacks” and thumbed through it looking for that hotel. It was not in there, but there were many outstanding examples of rustic architecture. I surmised that if I went to the Adirondacks with this book as my guide, I would surely come across the hotel I remembered, as it was famous enough to be in a magazine. I set out with my wife in the early nineties with a plan to travel the central Adirondacks to see as many of the camps as I could by car, boat, or foot. We started out with a great camps weekend at Sagamore learning about what makes a great camp and had a boat tour on Raquette Lake to see a number of historic camps from the water. The next day we walked to Camp Uncas from Sagamore. Along the way we passed the Road to Kamp Kill Kare and I inquired as to the possibility of seeing it. The guide, John Friauf, was clear that the owners at the time were very private and that it would be impossible. 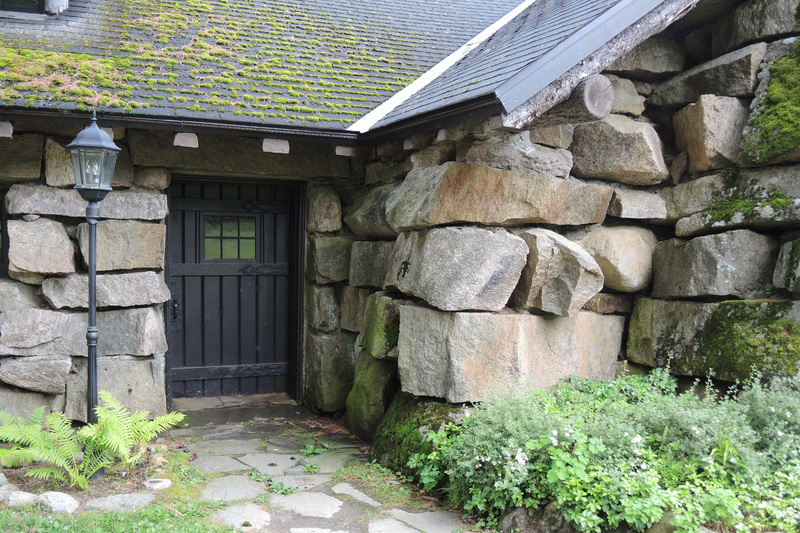 I had been struck by a photo in Harvey Kaiser’s book of the round gable window and the stonework in the barn and was intrigued by the craftsmanship, but went about putting the idea of seeing it out of my head. Architects have been known to do crazy things to see buildings, but hiking three miles into wilderness was a bit of deterrent. 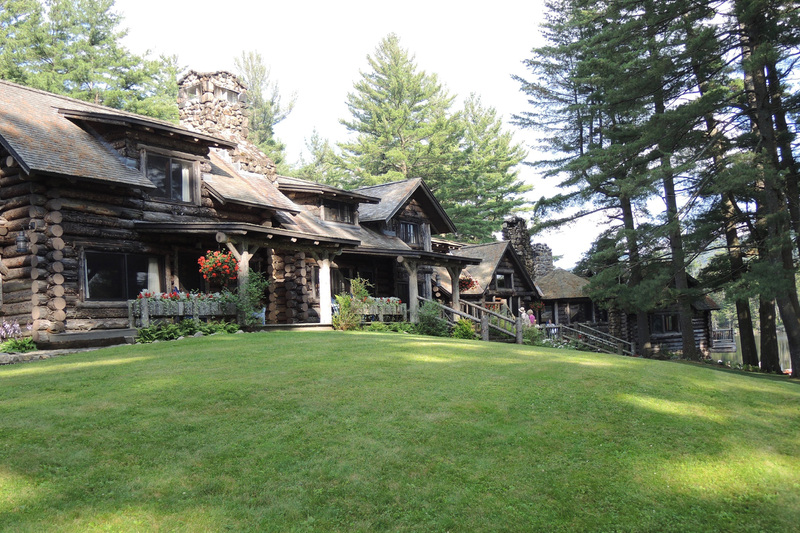 Next, we hiked into Santanoni, then on to Upper Saranac Lake for a stay at the Wawbeek. A canoe trip from the Wawbeek provided water views of a number of other camps on the lake nearby. The owner there was kind enough to get me into “The Point,” where I was able to take pictures of the buildings, but not any people. As it was now an exclusive resort, I wondered what famous person might be there, but saw no one familiar as I walked around. 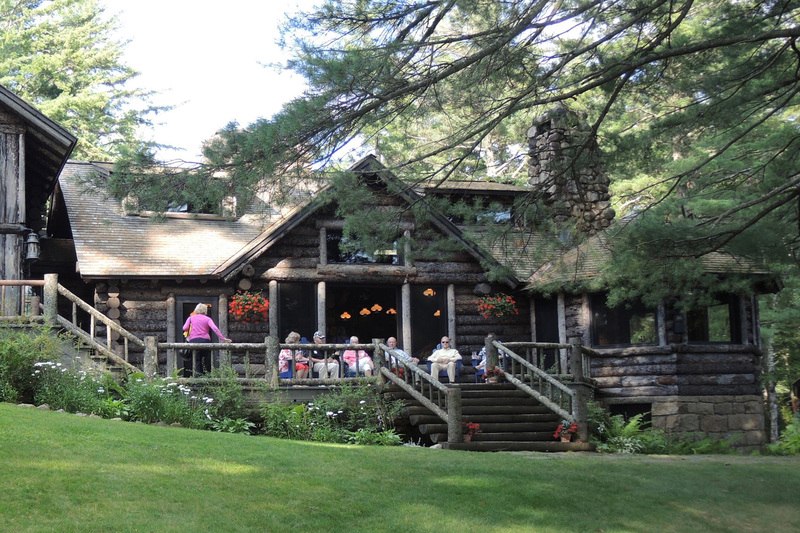 When we reached Paul Smith’s we saw Northbrook Lodge and discovered that another camp known as White Pine Camp had just been opened for tours. At the gatehouse I picked up a brochure for the Adirondack Architectural Heritage (AARCH) and decided to join to see if it might be my ticket onto other camp tours that I could schedule vacations around. I have since learned that this was shortly after AARCH was formed. Twenty some years later after many vacations and other camp visits, the opportunity to tour Kamp Kill Kare arrived in my mailbox through AARCH’s 25th Anniversary Year tour schedule. It had recently opened as an exclusive limited stay resort and had been renamed Lake Kora after the adjacent lake. The event invitation described an extended tour on a Sunday afternoon ending with cocktails. I was ecstatic for the opportunity to check this camp off my list. Like the book 1000 Places to See Before You Die, my own list includes a multitude of architectural landmarks. As an architect my excitement was palpable as the day neared. After the three-mile drive in, we arrived at the tower gate shown above. Little did I know that the round gable window of my memory was but a small detail of a barn complex that enclosed a large yard–the cow barn formed one leg and the horse barn, without its roof due to a fire, formed another, and the third leg was the service wing. This open space in the midst of the forest had a spiritual quality. Olmstead talked about the experience of a meadow in the midst of the woods and here it existed with powerful effect, enhanced by the visual strength of the wall around it. The power of the stonework was expressed in gigantic blocks of stone skillfully laid, gravity gloriously expressed. But who performed the work to get them in place, artfully bearing upon one another? 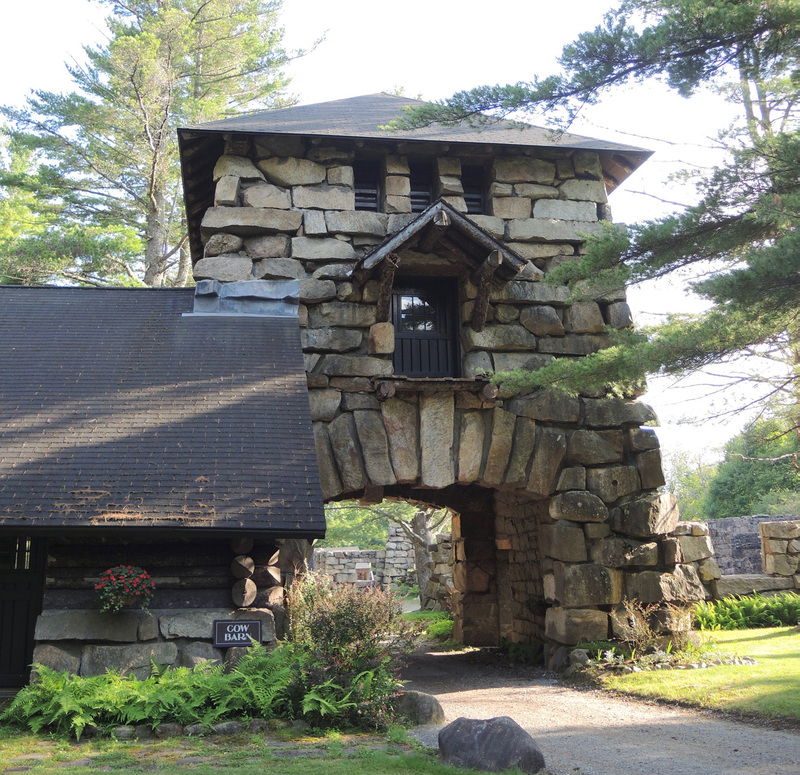 I have to say this complex was the single greatest surprise I have had in visiting Adirondack architecture over the years. The rest of the camp charmed as well–wearing over one hundred years of age and having been lovingly cared for by generations of several families. Standouts included the playhouse with its games, squash court and bowling alley. Rising and falling along the ridge above the lake stood the main cabin complex with Mrs. Woodruff’s Tree bed, called the most photographed bedroom in the Adirondacks. Not to mention the boathouse and the chapel. 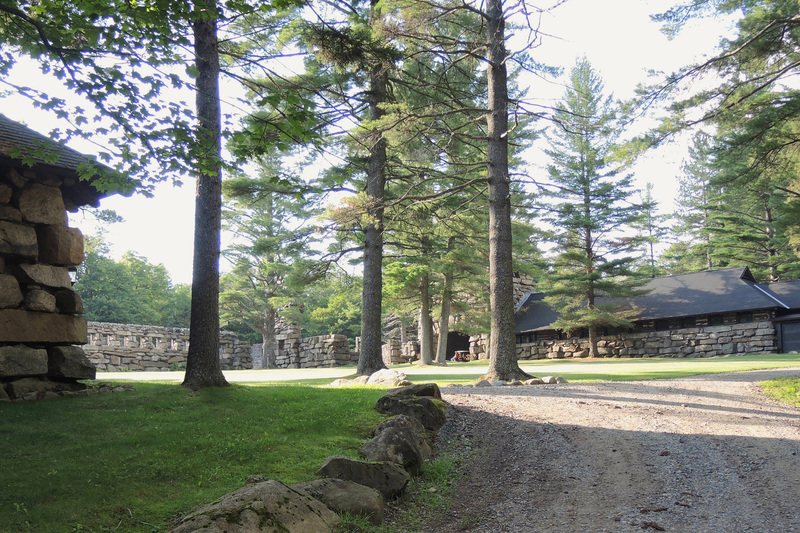 The cost of a night at Lake Kora would cover twenty AARCH memberships for a lifetime, yet the small cost an AARCH membership provided me a lifetime memory of experiencing an iconic great camp. For me, an over AARCHing reason to become a member and supporter of AARCH. 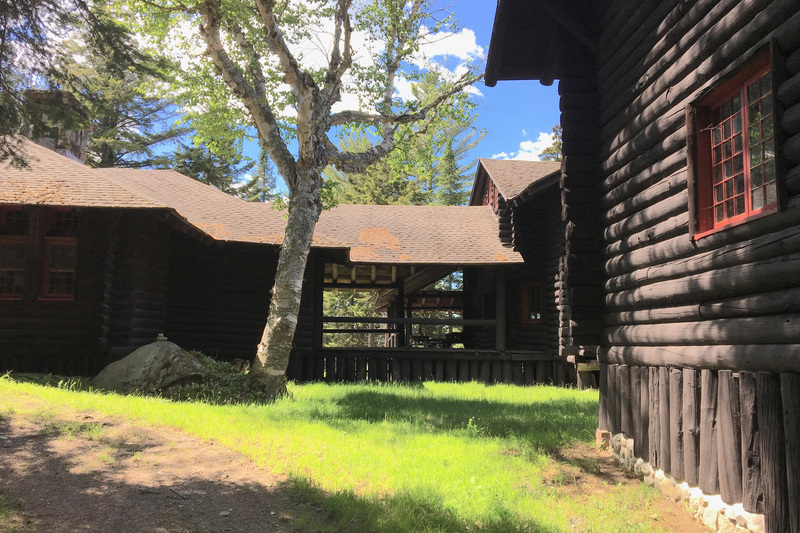 Our Executive Director, Steven Englehardt, is the first to tell you that Adirondack architecture is more than “great camps” and I couldn’t agree more having this summer taken a tour of Ausable Acres through AARCH of a mid-century middle-class resort community. But for me, it is the great camps and their architecture that draws from and harmonizes with the wilderness around it–where the experiences of building and nature are each enhanced by the presence of the other. Craftsmanship is the grammar and material creativity the vocabulary which work together to tell the story of humans inhabiting the wilderness. By now you are probably wondering if I ever found that hotel from the magazine. Well, it was not on that visit nor any subsequent ones to various parts of the Adirondack Park. I might never have found it except that years later I was on another plane and there was another magazine article about that very hotel. This time I didn’t make the same mistake and took the magazine with me and planned a visit to the Mohonk Mountain House in the Catskills. Two extraordinary places experienced, but still many more to see. Sorry – I see it was Monhonk Mt House. Pretty impressive. But the Sagamore is also worth checking out if you get a chance. Rebecca, I have been to the Sagamore several times and a good friend got married there. It is quite the setting as well.